In the newest edition of Weekly Shonen Jump a new Naruto movie has been announced. The major announcement of this movie is that it will be designed and wrote by mangaka Masashi Kishimoto, who created the Naruto series. The film, which is the ninth Naruto film in total, but the sixth Naruto Shippuden movie, will open in Japan on 28th July. Unfortunately there are not many details regarding the plot etc at the moment, but as they are released i will post them here. accessories, earstuds, locket, rings, trinket, bangle & hair accessories. earrings, earstuds, locket, rings, hair, bracelet & bangle add-ons. on this subject? I'd be very thankful if you could elaborate a little bit further. Appreciate it! In fact when someone doesn't understand then its up to other people that they will help, so here it takes place. It's truly very complex in this active life to listen news on TV, so I simply use the web for that reason, and get the most recent news. It's pretty worth enough for me. In my opinion, if all web owners and bloggers made good content as you did, the web will be a lot more useful than ever before. I read this post fully concerning the resemblance of latest and earlier technologies, it's remarkable article. 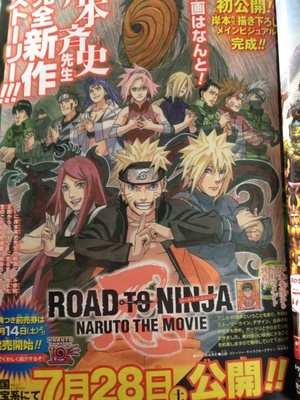 Thanks for finally talking about > "New Naruto Shippuden Movie Announced - Naruto: Road to Ninja" < Liked it! is the best I've discovered till now. But, what in regards to the bottom line? Are you positive about the supply? What's up to every one, the contents existing at this website are really amazing for people knowledge, well, keep up the good work fellows.